I mounted my F18A in a pretty good spot a few years ago. That is, until I started using my PEB. The VGA cable was in the way and I had to move the TI too far away for my liking. So I then wondered if they made right-angle VGA adapters. And what do you know...they do! Anyway, I'd thought I'd share for anyone in the same situation. I can't remember what I paid for it but it was well less than $10 US with free shipping from China. Took two months to get here. The quality is actually pretty good. If you get one, just make sure you look closely at the pics! There are different genders and left/right angles. Pretty spiffy, thanks for sharing! Just in case comment: I would have had to use one with the other angle, as the one you used would have blocked my USB keyboard connector. I took the easy way out at the time, and just extended the VGA cable out for an easy external connection. Not neat and clean, but works well. Also worth noting that there are (more uncommon, but still around) up angle, down angle and right/left angle DB9 adapters. 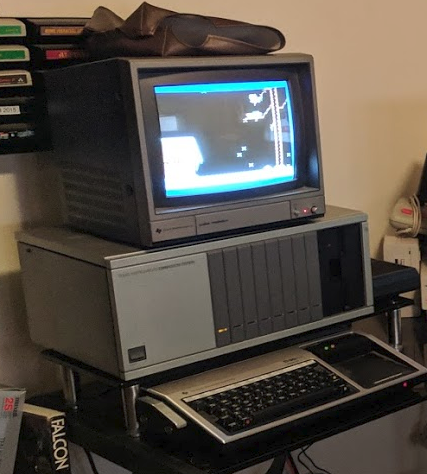 I've got one on the joystick port of my TI 99, as I don't have the space for a regular joystick plug on my rackmount apparatus (TI99 + Speech + NanoPEB + DB9 connector just fits in a 19" rack). You have a rack mount TI? You. Sir. Are a legend. uh... ME?... I'm another story. Edited by LASooner, Thu Mar 14, 2019 3:04 PM. sorry... the aircraft carrier is connected to the... interface card... the interface card is connected to the... fire hose... the fire hose is connected to the... elephant's paw... the elephant's paw's connected to the console. . . I have an extension cable, so my speech synth and fire hose are neatly tucked under the PEB. But before I got the extender cable, it all fit under there too, and stuck out a little on the right. I just had to have the keyboard moved a little further under it to clear the front post. Which extender cable did you go with LA?